Donating your time to a cause can be rewarding on a personal level, but it can also get you a head start to achieve your career goals. We already spoke about how volunteering can help you. Volunteering doesn’t just give you a satisfied feeling at the end of the day; it can also help future schools and employers see your merit and link you with more scholarship opportunities to help you achieve your goals. Helping others demonstrates selflessness, which is a trait universities find attractive in their students. While schools want students that succeed academically, they also want students that will promote the school in a favorable light, so your altruism will be a desired trait among scholarship applicants. While you are helping others, you naturally become more connected with the people you serve. Becoming a donor and organizing donation drives will connect you with other donors who are passionate about a cause. Coaching a little league team lets you meet parents and athletes in the community. These members of the community can alert you to unknown scholarship opportunities, and they can be a strong letter of reference outside of school. Whether you’re tutoring at a local school, building houses, or organizing teams for a charity fundraiser, you build useful skills while volunteering. Strong communication, management, and instructing skills are helpful for all scholarships, and specialized skills might qualify you for work-based scholarships as well. Anyone who can juggle school, homework, and extracurriculars and then successfully add in helping others on a regular basis is a master of time management. This means they will do well as a student, and scholarship committees recognize this correlation when awarding money. Even if you can not completely volunteer, you could highlight a history of donation to show you are able to give back and plan ahead. For example donating old clothes can be spinned to show you are able to identify things you do not need and make valuable selfless choices. Anyone who is committed to volunteering will eventually find a cause they are truly passionate about. This will help guide your career choices, starting with your choice of college and declaring a major. When scholarship committees see a student who is already on the path to pursuing their dream, they are more likely to award scholarships to help that student achieve their goals. Having a goal sets you apart from other candidates who merely did well in school but are unsure of their plans. 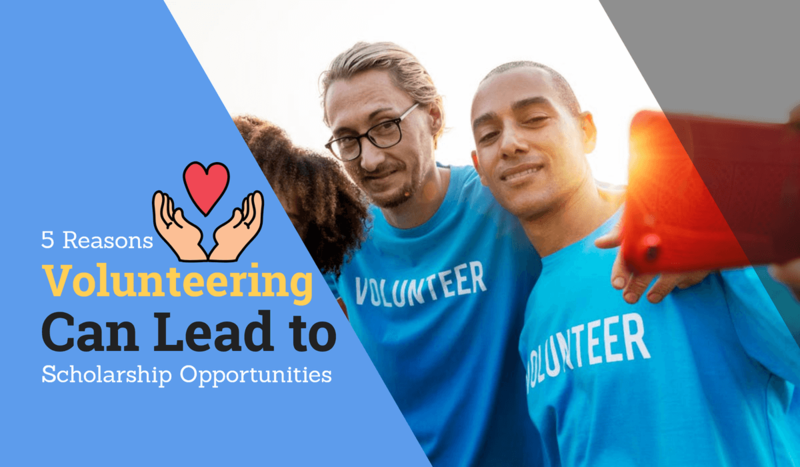 Volunteering gives a sense of accomplishment and connection to the community, and these five reasons show that it also connects you with more scholarships. The skills and experience you gain from helping others will help you as well by giving you access to unknown scholarships, positive references, and a sense of what your passions are. Find an opportunity to volunteer today so you can enjoy more scholarships tomorrow.